Whether you succumb to the charms of this unique, historic town in the heart of Austria that gave Mozart to the world, to the beautiful surrounding Alpine countryside, or to the magic of the Salt Chamber, Salzburg and its vicinity will captivate you on your first visit, and draw you back again and again. Advice: In summer, go for a ride to some of the restaurants in the neighboring hillsides offering perfect views, or go by car to Germany to see “Rossfeldstrasse” over Berchtesgaden up close – also with interesting views. Although you have to pay for going through, without excessive effort you can get almost to the peaks of the surrounding mountains – an altitude of up to 1,600 meters. – recently reconstructed “art hotel” in the city center, in the most famous lane of Salzburg. 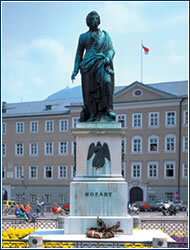 Well-known German actor Veronika Ferres used to live there during the Salzburg festivals. The building is a combination of traditional and modern styles. Favorite restaurant: Stiftskeller St. Peter, tel. +43 662-841268-0, www.haslauer.at – the oldest restaurant in Austria. – shop filled with Easter eggs, all year long. – a unique new exposition of talking and singing wax dummies, is located in the museum’s 2400 m2. You will discover the origins of the “Silent Night” song, and meet the famous movie “The Sound of Music”. Your guide through the museum is the mysterious Dr. Miracle. 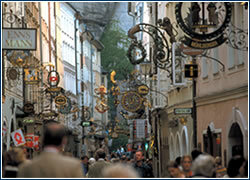 Best-kept secret: Why are Salzburg inhabitants called “Stierwascher”, which means “bull-washer”? In the times of jacquerie (around 1500), the Salzburg castle was under siege, the enemy wanted to starve out the population which had only one more bull. But every day they displayed him on the rampart dyed a different color, to give the impression that they still had a large herd and thus food enough, and every day they washed him and dyed him again. Good advice: Only in Salzburg you can buy the original chocolate “Mozart Balls”. In 1890, confectioner Paul Fürst originated them in Salzburg, and today his great-grandson Norbert Fürst, with his son Martin, produce them in the coffee bar Fürst, on Brodgasse 13.
www.salzburg.info – official website of Salzburg Tourist Office. 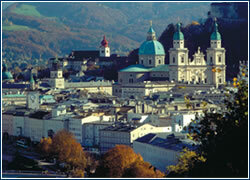 Comprehensive service for all tourists and businessmen coming to Salzburg. 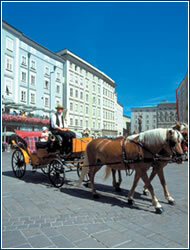 www.stadtbus.at – central Salzburg is nicely walkable, but you’ll need a bus to get to Mirabellplatz and Hellbrunn. Here you’ll find the necessary bus information. www.stadt-salzburg.at/wirtschaft – Economic information useful for anyone planning to conduct business in Salzburg. · Almost every evening the oldest restaurant, Stiftskeller St. Peter, hosts a Mozart dinner concert. Musicians and singers in historical costumes perform the Austrian composer’s best-known arias, and the dinner is prepared according to recipes from Mozart’s day. · Each summer, from late July to late August, the town celebrates the world-renowned Salzburg Festival, offering dozens of operas, theatrical performances, and concerts. This year the program includes a total of 183 various events at 11 venues. · Salzburg is called “The Rome of the North” because it offers all sorts of attractions, such as churches, luxurious baronial manors, and museums. It’s a compact town; you can easily walk all over its center (in 1996 it was added to the UNESCO list) in a few hours, with a choice of over 400 shops. · Salzburg’s environs and Salt Chamber (Salzkamergut) provide great opportunities for outdoor sports. Besides paragliding, rafting, and bungee jumping, you can also enjoy more placid entertainment like pleasant walks, swimming in Wolfgangsee and Mondsee – the closest lakes to the Salt Chamber. 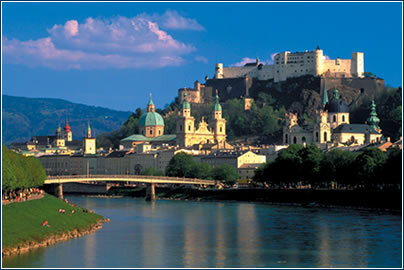 · Salzburg is also an ideal place to hold conventions. The new Salzburg Congress Center, with a capacity of 1,350 people, was opened in 2001. The rococo Schloss Leopoldskron palace is also a popular convention venue.